Born in 1980 in Fuxin in Liaoning province, China. He currently lives and works in Beijing. He graduated in 2005 from the Print-making Department of the China Academy of Art. In 2006 he established π Animation Studio. The works of Sun Xun are mainly drawing and/or short animation. 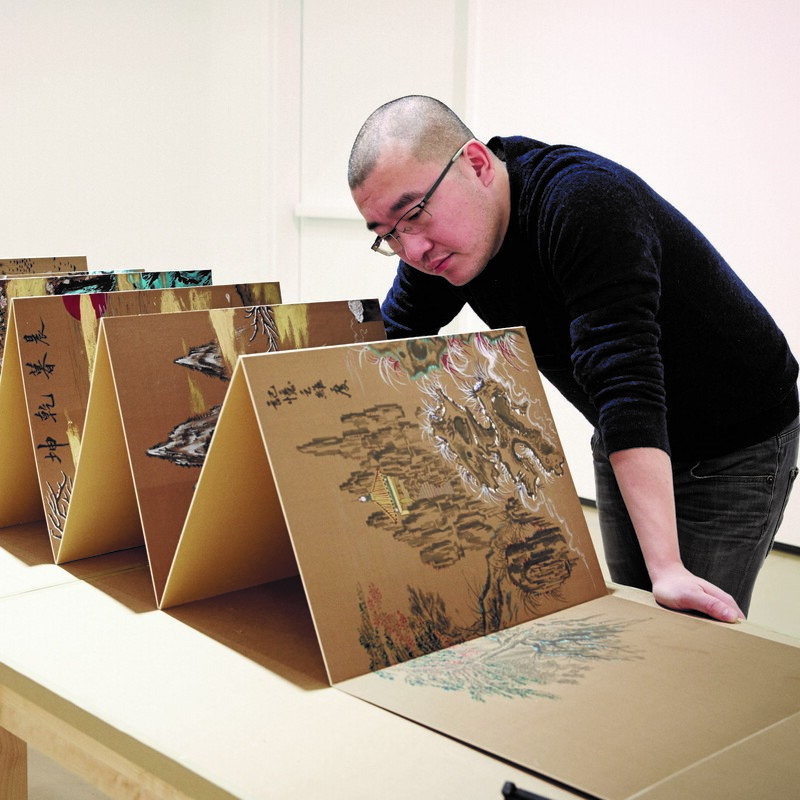 Sun Xun also exhibits his individual cell drawings and other mixed media works, often times alongside his films. His series of small mixed media works, entitled “Shock of Time” (2006), challenged notions of time, history and narration and utilized media such as newspapers, books and other documentary material that served to highlight certain passages of history. 21 KE (2010) was produced 3 years after its commencement and mainly completed by use of pastel and fusain on canvas. It constructs an impressive world full of wonders all in black and white. “Some Actions Which Haven’t Been Defined yet in the Revolution” (2011) is made by woodblock printing – a technique that was an important tool during the Cultural Revolution. This printing technique was used as an primary means of communication to quickly convey information to the masses. Clown’s Revolution (2010), Beyond-ism (2010) and other such new works exhibit Sun Xun’s recent attempt and breakthrough in the use of Chinese ink painting in his work. Although it is difficult, there is no doubt that the works are a perfect blend of traditional and contemporary art. Reality and fantasy, time and history, both are continuously seen in Sun Xun’s work. Works such as “21 KE”, “Magician’s Lie” and “Requiem” feature a key protagonist; a magician dressed in a black suit and a high top hat. The magician has been in search of another world, probably a utopia. Over the course of this character’s expedition, the sequences are dreamlike and apocalyptic. Sun’s works explore themes of societal development and revolution, referencing such theorists as Marx, Adorno, and Horkheimer. As a young artist, Sun Xun made an impressive impact, especially during recent years. He has received several notable awards including the “Chinese Contemporary Art Awards (CCAA Best Young Artist)” and “Taiwan Contemporary Art Link Young Art Award” in 2010, and the Civitella Ranieri Visual Arts Fellowship 2011/2012.